Fraternities and sororities are values-based organizations that focus on the development of leadership, scholarship, brotherhood and sisterhood, service, and community among their members. These values form the basis of members’ college experiences. The support and opportunities provided through the organizations connect members to their peers, the university community, and a network spanning hundreds of universities and classes. The National Panhellenic Conference (NPC)—one of the largest advocacy and support organizations for women—announced the 43 College Panhellenic Associations recognized with awards for excellence and achievement in their work to advance the sorority experience. The University of Oregon took home an Excellence Award. As a student, you are here to get a degree and contribute to the scholarship of our university. This core value is the basis and identity of our community. As a member, the experiences you get involved with contribute to your academic success and personal development. 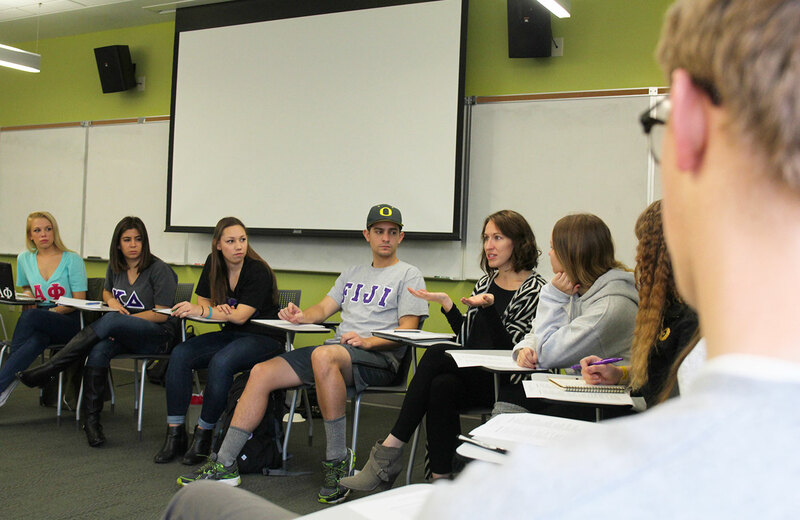 Whether the event is social, philanthropic, or academic, it is designed to positively contribute to your learning at the UO. Within our communities of motivated members, there is a large amount of time and energy that we commit to the communities around us. Members of our communities raise several hundreds of thousands of dollars for charitable organizations. Organizations work together and compete to contribute to the communities around us. The connections you form during your time in our community have the potential to last a lifetime. The friendships you create are based on the shared values of your organization and of our community. These relationships provide you with support to be involved, challenged, and engaged throughout your college experience. These are the people who you have made a commitment to and who have made a commitment to you so that you all can hold each other accountable to living your lives to the fullest. Our community is focused on being leaders on campus and in our organizations. As a member, you’ll have a variety of leadership opportunities in your organization and in our community as well as the chance to develop leadership skills you can apply in a variety of other positions. The Fraternity and Sorority Life Office offers a variety of programs and opportunities for you to grow as a leader and engage in our community. No community is created the same and each has issues that negatively affect it. Our community is dedicated to identifying the issues relevant to us and addressing them accordingly. But being in our community is more than an individual experience. It means you’ll be a part of a legacy that you will help define. Solving the issues relevant to our community means that you will be dedicated to and take part in taking care of one another. In order to join our fraternity and sorority communities, you can participate in the recruitment or member intake process. These are a series of social events and gatherings for you to meet and get to know members from the different chapters on our campus. Each chapter has a unique culture and it is important to find the one that fits best for you. The Fraternity and Sorority Life Offices coordinates a variety of programs, activities, and services that are designed to support the development, education, and social experience of members. We serve as a resource to our members and organizations to promote strong communities and exceptional experiences.